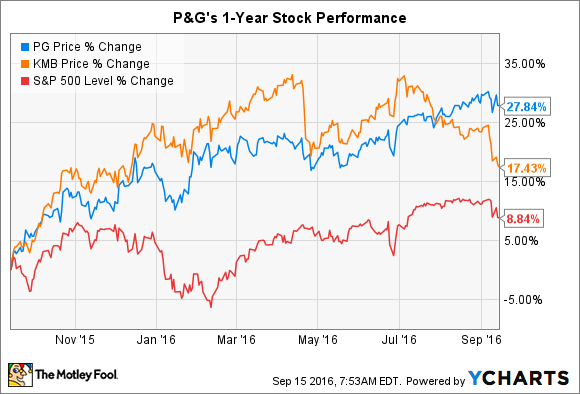 Where Will Procter & Gamble Co Stock Be 1 Year From Now? P&G is back to beating the market lately. Yet the company needs to post improving growth trends for the rally to continue. Procter & Gamble (NYSE:PG) shareholders have had a great 12 months. The consumer goods titan's stock is up nearly 30% since last September, making it the fourth-best performing component on the Dow Jones Industrial Average. P&G is also beating rivals like Kimberly-Clark (NYSE:KMB) by a double-digit margin. Improving sales volume trends, rising profitability, and a sinking share count all played a role in that outperformance. But the coming year could mark a return to weakness in the stock -- unless P&G can deliver on the turnaround goals that management has staked out. That all starts with faster sales gains. With the recent exchange of its Coty beauty line, P&G finally has the product portfolio it has been chasing for more than two years. Executives got rid of over 100 brands, either because they weren't dominant in their industry segment, faced a weak growth outlook, or were held back by below-average profit margins. What's left, management says, should produce a faster, more profitable business that enjoys 1 percentage point of improved organic sales gains and 2 percentage points of higher gross profit margins. Investors haven't seen hard evidence of this turnaround yet, but P&G recently forecast its first uptick in organic growth in three years. Kimberly-Clark and other peers are projecting significantly stronger gains, though, which is a reminder that P&G has a long way to go to climb out of its market share hole. Still, investors will likely be happy with steady organic growth gains of around 2% this year -- provided that they include a healthy mix of higher volume and pricing. 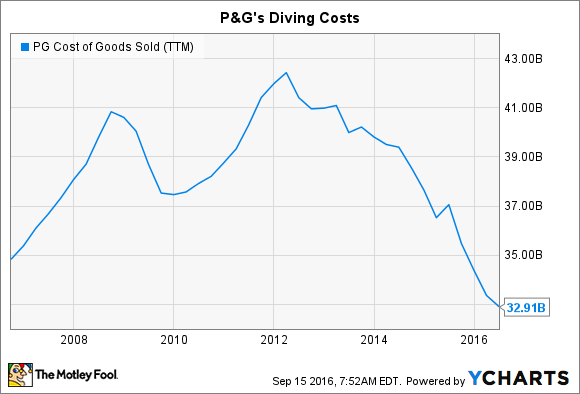 No matter what happens with sales trends, it's a safe bet that P&G's cost profile will be much lower in a year. Management has identified $10 billion of savings it can cleave out of the business by 2020 -- and these come on top of the many efficiencies it has already achieved. Improvement on expenses boosted gross margin by 3 full percentage points last quarter, and that trend should continue to lift results through fiscal 2017. P&G has a few investment priorities that it just can't skimp on, including innovation research and marketing costs. Overall, though, CEO David Taylor and his team say they can reach 4% to 6% profit growth this year over the $3.67 of adjusted earnings it produced in fiscal 2016. That would be good news for shareholders since P&G hasn't managed a gain on that metric since fiscal 2014. Even with an unusually weak dividend raise this year, P&G has been showering investors with cash lately. It spent $15 billion over the last 12 months on dividends and stock buybacks and intends to keep spending at that incredible pace through fiscal 2019. Much of the cash came from brand divestments, which aren't going to lift results after this year. That's why it's so important that P&G at least get back to matching its long-run growth pace. After all, cost cuts and brand sales can only offset weak revenue gains for so long. If P&G doesn't see a solid growth turnaround in fiscal 2017, then income investors are likely to receive another underwhelming dividend boost early next year. While P&G shares have outperformed the market over the last 12 months, the stock is trailing the Dow by a wide margin over the past five-year period. This recent jump is really a bet on the part of investors that it is about to post a significant rebound in its operations. It's now up to P&G to show whether that optimism is warranted.